The biggest news from President Obama's Oval Office address is that cap and trade legislation is probably dead for the foreseeable future, and the administration is seeking new ideas. Instead of using last night's prime-time opportunity to push cap and trade in the form of the Kerry-Lieberman American Power Act -- as many climate advocates saw as their last hope for "comprehensive" climate reform -- President Obama pressed the reset button on energy and climate policy, saying he was "happy to look at other ideas and approaches from either party, as long they seriously tackle our addiction to fossil fuels." He made no mention of setting a price on carbon or establishing an emissions cap and trade system. As Andrew Revkin observed at New York Times Dot Earth, the president "signaled that he is leaving open a variety of paths on energy and climate policy and no longer hewing tightly to the idea of a cap and trade system for restricting heat-trapping emissions — which he never wavered from during his campaign." David Roberts of Grist, one of the few remaining hopefuls for cap and trade reform, wrote "Final thought: Obama didn't drive the carbon cap tonight, so there won't be a carbon cap in the energy bill this year." If cap and trade is dead, then what's next? The only serious alternative that could attract bipartisan support is a comprehensive national strategy for clean energy competitiveness and innovation -- including substantial new federal investment in research, development, demonstration, deployment, and manufacturing -- to accelerate America's transition away from fossil fuels, build a strong and competitive clean energy industry, and rapidly drive down the price of low-carbon power and transportation technologies. These investments could potentially be included as part of a comprehensive energy package, building upon the proposed American Clean Energy Leadership Act. Cap and trade has long dominated the debate, but a large number of think tanks, business leaders, and academics are rallying behind such an "energy innovation consensus," which places these federal investments at the front and center of the energy and climate agenda. President Obama cited these experts in his speech, noting that "Others wonder why the energy industry only spends a fraction of what the high-tech industry does on research and development -– and want to rapidly boost our investments in such research and development." The energy innovation consensus currently includes dozens of Nobel Laureates, Breakthrough Institute, Brookings Institution, National Commission on Energy Policy, Third Way, Association of American Universities, Clean Air Task Force, Information Technology & Innovation Foundation, Google, and Americans for Energy Leadership, among others. The latest group to join is the American Energy Innovation Council (AEIC), made up of several of the nation's top business leaders: Bill Gates, Jeff Immelt, John Doerr, Chad Holliday, Norm Augustine, Ursula Burns, and Tim Solso. Last week, these leaders released a new report, "A Business Plan for America's Energy Future," calling for major new federal investment in clean energy technology RD&D — at least $16 billion annually, more than triple the current level (see our news roundup). In fact, such an energy innovation strategy was originally at the center of the Obama administration's energy and climate agenda. 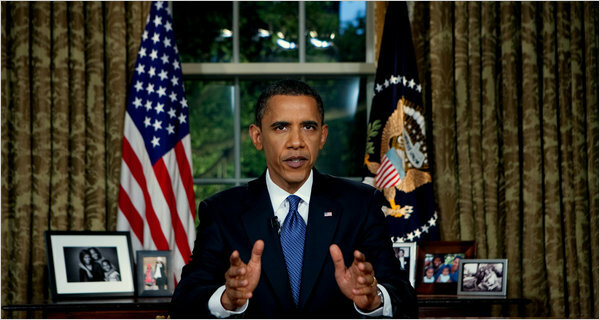 Throughout his campaign and the beginning of his presidency, Obama consistently promised he would increase federal investment in clean energy R&D by $15 billion per year. As one of the administrations "Guiding Principles" on energy and environment, the White House website still states that it will "Invest $150 billion over ten years in energy research and development to transition to a clean energy economy." Time Magazine's Bryan Walsh wrote in response to the speech, "if Obama is really serious about changing some of the insane parts of our energy policy—like the fact that we spend less than $5 billion on energy R&D a year, a number that Bill Gates wants to triple—he could be truly revolutionary." Of course, cap and trade once offered an opportunity to fund an energy innovation agenda. However, as the Breakthrough Institute and Americans for Energy Leadership recently documented in our policy brief, "The Power to Compete," the Kerry-Lieberman American Power Act does not contain a comprehensive innovation strategy and would only increase federal clean energy RD&D investment by as little as $2.2 billion per year. The Waxman-Markey American Clean Energy & Security Act contained similarly low support for innovation. These proposals focused on capping carbon, not promoting clean energy technology innovation. Without cap and trade, the federal government will need to identify an alternative revenue stream. The AEIC proposes other possibilities, such as a wires fee on electricity, reduced fossil fuel subsidies, fees on offshore oil and natural gas production, an oil import fee, or increasing the gas tax. Regardless of the revenue stream, the report notes, "The essential requirements, though, are that we make the basic investment, and that we commit these funds, steadily, over the long term." Some will argue that the country can't afford these investments. But as the AEIC also states, "underfunding RD&D is an exercise in gross fiscal irresponsibility. The oil embargoes of the 1970s caused recessions that cost this nation more than a trillion dollars—yet we invest tiny sums in reducing petroleum dependence. The country sends $1 billion overseas every day to purchase oil, but publicly funded research in advanced vehicles and alternative fuels totals just $680 million annually — about 16 hours worth of oil imports... We will not save money by starving ourselves of future options." Moreover, if the United States fails to make these investments today, the vast majority of future tax revenues, jobs, and exports associated with the growing clean energy industry will accrue to foreign nations like China, as we documented in "Rising Tigers, Sleeping Giant." Last night President Obama declared, "Now is the moment for this generation to embark on a national mission to unleash America’s innovation and seize control of our own destiny." Indeed, solving the nation and world's energy problems is most centrally an innovation challenge, one that requires a bold new policy approach. The president has signaled the need for a new agenda, and comprehensive energy innovation reform offers the best opportunity.